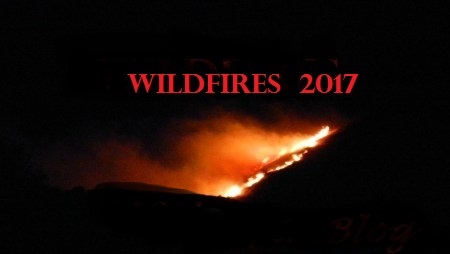 NEW MEXICO | CAJETE FIRE | NEW! Community Meeting will be held on Saturday, June 17 at 1800 hours @ the Jemez Mtn. Baptist Church at 6 Riverview Ct., Jemez Springs. A wildfire is burning 8 miles NE of Jemez and NE of Jemez, as well as West of the Los Alamos Highway on the Santa Fe National Forest, New Mexico. A Type 1 IMT is Command. 300 personnel are attached. There is currently 3 Type 1 Crews, 5 Type 2 crews, 9 engines, 1 dozer, 2 water tenders, 2 Type 1 helicopters, 1 Type 2 helicopter, and 1 Type 3 helicopter. The fire has exploded overnight to 1,315 acres and has a high rate of spread (ROS) and is said to be burning on both sides of Highway 4 (Southern Boundary). Fire behavior also has increased with now 6″ flame lengths. It is also burning in the footprint of the Las Cochas Fire that destroyed 63 structures and 156,000 in 2011. About 70 structures are under direct threat with evacuations of homes and one lookout tower are now in effect. Fire Suppression costs have reached almost $1 Million and is currently sitting at $900,000 but are expected to increase even more. The #NWFB can also be found on our Facebook Page and on Twitter @nwfireblog. You can also follow us here on this blog via email notifications. Thanks for reading our posts. We’d love for you check out the rest of our Blog here.